- Swim with Bondas the friendly dugong and admire the richly coloured sunsets at Lamen Bay. - Surf at northeast Epi. - Snorkel at Nikaura's Marine Protected Area. - Walk around the island. Epi's economy is largely dependent on agriculture. 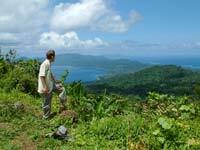 Along the west and northeast coasts of Epi there are extensive coconut plantations, vestiges of a copra boom in the early 20th century. Other crops are peanuts (in the hills of east Epi) and kava. 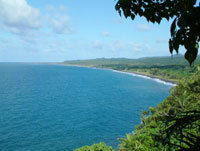 Epi is close to Efate and airfares from Vila are relatively inexpensive. Many people visit just for a few days and then return to Port Vila. If you want to spend more time and see the best of Epi you can walk around the island. Island hopping by ship between Epi and Ambrym is easy, with reliable weekly services through Lamen Bay. There are two airports on Epi. Lamen Bay shares flights with Craig Cove, Ambrym. Valesdir shares flights with Tongoa and Emae in the Shepherds. It should be possible to fly to Lamen Bay from either Port Vila or Santo. Valesdir is connected only to Port Vila. Check the Air Vanuatu website for more up-to-date information. Return airfares from Vila are about 15388 Vatu to Valesdir and 18020 Vatu to Lamen Bay. Tourists holding a return Air Vanuatu international ticket are entitled to a 20% discount on these fares). Exchange Rates. When booking flights on the Shepherds loop (Emae, Valesdir, Tongoa) you may be told they are fully booked but you arrive at the airport and the plane is not full (we've been told this is normal). The L/C Brisk sails for Lamen Bay and onward to Ambrym, Pentecost, Ambae and Santo on Monday nights (January 2009). L/C Tina-1 sails the same route, in reverse, Santo to Vila. These ships can be found at the main wharf in Vila and at Melcoffee on Santo. The ship Big Sista goes to Santo via Epi, leaving Vila Monday afternoon and arrivng at Lamen Bay at around 10 in the evening. It returns to Epi from Santo on Wednesday at lunch time and arrives at Vila by 7pm. 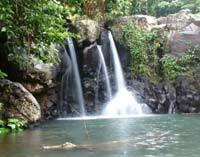 A trip from Epi to Vila cost 5500 Vatu per person for second class and 6000 Vatu for air conditioned first class. Exchange Rates. Other boats are the M/V Saratoka, servicing Epi, Paama and southeast Ambrym (Taveak) from Port Vila and the L/C Freedom, servicing the Shepherds and Epi. A one way fare from Vila to Epi on the cheapest boats is around 4500 Vatu. Exchange Rates. There are roads on Epi but only about half a dozen trucks and no regular public transport. If you want to travel by truck you either have to wait or book a charter. Exchange Rates. If there's no truck you can walk or sometimes catch a passing boat (on the west coast) which costs about the same as shared truck transport. To Nikaura, it's cheaper to start walking and then catch a ride on the road, locals often pay as little as 100 Vatu this way. However, some trucks only go as far as the hospital, on top of the hill. Development on Epi is concentrated in the northwest where there's the island's administrative centre at Rovo Bay and a hospital at Faimali.